There are many buzz words for garden pest control these days, chef among them is IPM , Integrated Pest Management. There is no way to keep all of nature out of your garden. The best a gardener can do is to work within the balance of nature and balance is a lot easier to maintain than it is to regain. That’s the beauty of IPM, a combination of knowing when and why a problem is likely to occur, taking steps to avoid the problem in the first place, keeping an eye out for changes and using low hazard, economical control methods when necessary. IPM was initially developed for commercial farmers, in response to the high cost of using synthetic pesticides. Home gardeners have adapted the principles of IPM and it can be effectively employed against vegetable garden pests, without the use of any synthetic pesticides. Prevention: How can I prevent problems from happening? Monitoring: Is it really a problem or just an isolated incident? Analyzing: How much damage am I willing to tolerate? Control: How can I stop it before the damage spreads? Prevention: How can I prevent problems from happening? Keep a healthy garden. Plant varieties that are suited to your site. Know what insects and diseases are prevalent in your area and plant resistant varieties. Make use of trap crops and row covers, to exclude and divert garden pests. Interplant vegetables, to slow the spread of problems. Stake plants to keep them off the ground and dry. Water regularly, so plants aren’t stressed by drought. Mulch to prevent splashing soil and pathogens onto plants. Rotate your crops to prevent the problem from over-wintering. Remove and dispose of diseased or infested plants. Remove all plant debris in the fall, so there is no shelter for over-wintering garden pests and spores. Monitoring: Is it really a problem or just an isolated incident?Know what you’re dealing with. Monitor your plants regularly. Watch for the first signs of garden pests, like holes, wilting, webs and color changes. Check the undersides of leaves. Identify the problem before treating it. Is it a disease, an insect, a nutrient deficiency, rabbit damage...? Spraying insecticidal soap on bacterial wilt isn’t going to do anything. Is it going to spread or is it temporary? Some problems are seasonal. Squash borers will mature and leave the garden by mid-summer. Cucumber beetles will spread disease throughout your crop. Analyzing: How much damage am I willing to tolerate?Don’t over react. One hornworm should not send you to the shed for the sprayer. Is the insect making the leaves ugly, but not harming the vegetable? Will the problem be gone before any real damage is done? Is this an isolated problem that will clear up when the weather changes or the insect moves on? Am I willing to sacrifice some dill to have swallowtail butterflies? Control: How can I stop it before the damage spreads?When the problem won’t go away on its own, start with the least toxic solution first. Trapping garden pests with diversion crops, lures or sticky bands is useful for lowering pest populations and for monitoring how bad the problem actually is. Hand removal is easiest if started early. Remove the infected or infested plant before it has time to spread. You can monitor for pest egg masses on the undersides of leaves and squash or remove the eggs before they become a problem. Many beetles are slow moving, especially while mating, and you can knock them off plants into a jar of soapy water. Borers can often be cut out of the affected plant part without killing the plant. Pesticides use may become necessary.There are dozens of organic and botanical pesticides available for use on edible crops like vegetables. Start with the one that is the least toxic and the most effective. Just because a product is organic doesn’t mean it’s harmless. Some can be toxic to humans and some are toxic to nearby animals, insects and plants. 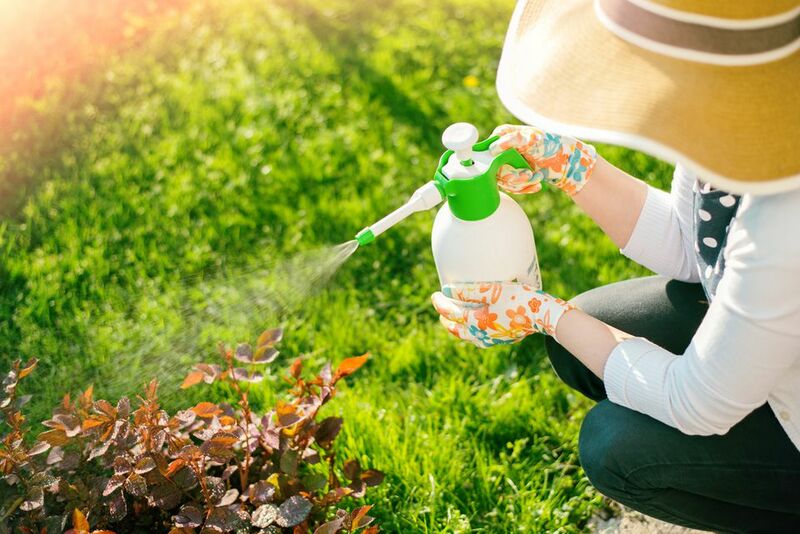 A less toxic pesticide that has to be used repeatedly can wind up doing more damage than using a stronger pesticide once.On the other hand, a strong pesticide sprayed on an insect that is resistant to it is senseless. Because if you can keep your garden in balance, you’ll have less problems in the long run. You won’t lose entire crops of vegetables to a single infestation. Using a combination of environmental, cultural and low toxic solutions will allow the “good” insect population to survive. You need these insects to control the pest insects and to pollinate your plants. Your soil will remain healthy and fertile, which will make your vegetables that much more nutritious. Your garden will be a safe place for the kids and pets to visit.